Right-wing media figures have helped promote a series of myths about transgender service members in the U.S. military in response to President Donald Trump’s announcement that he would ban them from serving. These debunked myths include the claim that the cost of medically necessary health care for transgender service members would be in the billions, that allowing transgender members to serve would interfere with military readiness and cohesion, that a majority of transgender people are unable to be deployed due to their health care needs, and that being transgender is a mental illness that makes people unfit to be in the military. 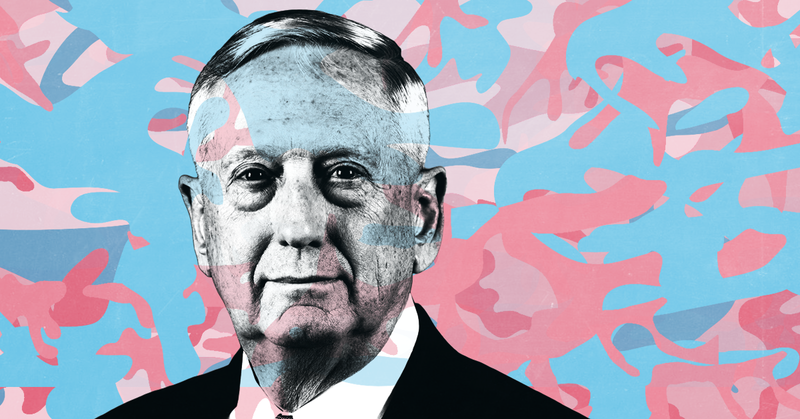 Media outlets widely and misleadingly reported that Defense Secretary James Mattis had “frozen” President Donald Trump’s plan to ban transgender people from the military. A few days after Trump sent him a directive on the issue, Mattis announced on August 29 that he would “carry out the president’s policy direction” while “in the interim, current policy with respect to currently serving members will remain in place.” But Mattis’ statement was exactly in line with each step of Trump’s directive, which granted the defense secretary time to “determine how to address transgender individuals currently serving” in the military. Numerous headlines and reports on August 29 suggested that Mattis had paused Trump’s transgender military ban, framing the situation as if Mattis was defying Trump’s orders. The New York Times said Mattis had “kicked President Trump’s proposed ban … down the road,” and an ABC affiliate’s headline said Mattis had made the decision “despite Trump’s order.” The Washington Post said Mattis announced “that he is freezing the implementation of” the ban. Many other headlines asserted that Mattis’ announcement constituted a freeze of or “hold on” Trump’s policy. Similarly, Politico’s Eliana Johnson called Mattis’ statement “kind of a rebuke” of Trump’s announcement during an appearance on MSNBC. But Mattis’ statement is exactly in line with Trump’s August 25 directive. That directive gave Mattis until February 21 to “determine how to address transgender individuals currently serving in the United States military” and called for “further study” of the issue even though there has already been extensive study on transgender service members. A Pentagon-commissioned 2016 Rand Corporation study found that “allowing transgender personnel to serve openly” would have “little or no impact on unit cohesion, operational effectiveness, or readiness” and minimal costs. Trump’s directive explicitly called for reinstating the ban, asking the Pentagon to “return to the longstanding policy and practice on military service by transgender individuals that was in place prior to June 2016,” when the Obama administration announced that transgender Americans “may serve openly” in the armed services. There are repercussions to the misleading reports and headlines on Mattis’ statement. Stern’s post in Slate concluded that the stories about a “freeze” “serve the administration’s narrative in two ways: They legitimize a ‘study’ that is designed to reach a foregone conclusion, and they falsely portray the ban as more lenient or unsettled than it really is.” This morning, a panel discussion on MSNBC’s Morning Joe suggested that perhaps Trump “didn’t really want to” implement the ban. Host Joe Scarborough remarked that “Donald Trump saying I really don’t want to do this” would make “a lot of sense,” and he also echoed debunked but insidious arguments that Trump might be “supportive” of LGBTQ rights. Despite those suggestions on Morning Joe, media should have no doubts about Trump’s intention to ban transgender people from the military. On July 26, Trump explicitly said on Twitter that “the United States Government will not accept or allow transgender individuals to serve in any capacity in the U.S. Military,” and he has done nothing to indicate otherwise since then. Trump’s August 25 directive clearly stated his intent to reinstate the ban, and Mattis’ statement did not suggest that he would not be complying with the directive. Fox News guest on military transgender ban: "We shouldn't recruit people with any kind of physical or mental illness"
A Wall Street Journal editorial asserted that the Army's achievement of exceeding its goal of recruiting or retaining 80,000 troops for fiscal 2006 demonstrates that "many troops believe in the mission." But the editorial omitted the fact that the Army exceeded its goal by "recruit[ing] more than 2,600 soldiers under new lower aptitude standards this year," according to an AP report. Rush Limbaugh claimed without evidence that "the media" had reversed their position on the condition of American troops' body armor in response to reports that ABC World News Tonight co-anchor Bob Woodruff and cameraman Doug Vogt survived a roadside bombing in Iraq because they were wearing body armor. CBS anchor Bob Schieffer reported that Defense Secretary Donald H. Rumsfeld rejected a Democratic study that showed that the military has been strained by the wars in Iraq and Afghanistan, but Schieffer did not note that Rumsfeld also rejected a Pentagon-funded report that came to a similar conclusion. Barnes: War in Iraq is "not intensifying"; U.S. troops "aren't the targets"